I decided to write about a recent poor decision I made at the beach. I share this with the hope that someone reading may gain some insight, and not have to learn this same lesson the hard way. Moving forward, I will be much more willing to eject from my kite, period. April had been a good month, averaging two sessions a week locally, then came May where I only had one session the whole month. On June 15th I was down at Richmond Beach in the afternoon. The tide was very low, lots of exposed baseball sized rocks covered with green slime and barnacles, but there was wind. I was stoked to get out…….in a hurry (big effing mistake right there). Craig and Mike were also at the beach with me, but I was the first one to get set up and launched. The wind was light enough that I needed my 14m Rally, my biggest kite. So, I get launched, I get across the logs no problem and now I come to the slimy rocks. I don’t like having my kite straight overhead, especially at RB, which can be notorious for lofting people, but I couldn’t pick my way across these rocks with the kite pulling me sideways, so I raised it up……and instead of lofting, there was a lull in the wind and that 14m started to Hindenburg. Now, sometimes when you start to get slack, you can back pedal and regain tension in the lines, or, I’ve even ran at my kite as it started to power up again with only a slight tumble on the sand. This time I was stuck in the middle of those darn rocks and that’s where being “in a hurry” really came back to bite me. I should have not hesitated to eject my safety and just taken the extra 20-30 minutes to gather up my lines and my kite and re-rig. Instead, I had the foolish notion that “I can catch it” when it powers up. It all happened so fast. The guys said I “super manned” it across the beach (of slimy rocks). When I replay it in my mind I just remember being yanked, then laying there on my stomach realizing I needed to roll over and deal with my kite, which was now happily bobbing on its wingtip, just waiting to be re-launched. Well, that wasn’t going to happen. The guys came running to see if I was ok and really just took over. I just needed to sit for a minute and take stock of myself. They gathered up my gear, rolling up my lines and my kite. I was pretty banged up with a gnarly cut on my right palm and I hurt all over. Steve had come down from the parking lot when he saw my kite go down and the guys go running and he helped me get all my gear back up the hill. I really appreciate all three of you guys who helped me that afternoon. Oh, and FYI to anyone needing urgent care in the Richmond Beach area; there is a new Swedish Primary Care facility in that QFC parking lot on Richmond Beach road………they’re by appointment only. Their urgent care is at their campus of what used to be the Stevens Hospital in Edmonds. I got six stiches in my right palm and they took an x-ray of my right shoulder since I couldn’t raise my elbow. The doc said I’d probably torn something internally and to see an orthopedic doc if the weakness persisted. The MRI showed that one of the rotator cuff tendons had torn loose from the bone. I had shoulder surgery on 7/27 and have another week left in my sling before I can start physical therapy. What an eye-opening experience this has been for me. I’ve been active my whole life, and have gotten banged up here and there, but never anything very serious. Maybe I was just complacent about how quickly things can go wrong, and how badly a person can get hurt. I’m very thankful to not have been hurt worse, and that no one else got hurt either. I know moving forward I’ll be much quicker to push that safety. I hope this story helps someone else decide to eject when there is slack in the lines, at least if you’re in a spot where you can’t do anything to manage it. I should also say this has not dampened my love for kiting. The people I’ve met, friends I’ve made, and this sport have helped to make these northwest winters bearable. Something to look forward to when the storms move in. I hope to be able to reach up and grab my control bar (with both hands) before the end of October! See you at the beach! Thanks Shoop for sharing your story. Glad you are on your way to a full recovery. Also, nice to be reminded about how helpful other kiters and beach goers can be when they see issues. It is good to have this posted on PSKITE where it can be quickly accessed and referenced, Facebook is fine, but meaningful topics/history to learn from is not easy to find there. 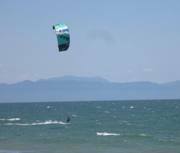 Most of us have been in your situation after a while of kiting or reminded quickly after a summer of bad habits kiting in light winds. Last month at West Beach coming in on the big round wet rocks in the surf, same situation; put the powered 12m overhead, gusty hindenburger, hesitated, then QR. Picking up the mess in the surf I was happy my hesitation was short. Mostly all my summer kiting the past months has been at the non-gusty Everett Jetty, parking it overhead frequently and usually go for the save instead of the QR. Fall kiting is almost here and it's time to loose my bad habits and step up my prevention/awareness. Once again, thanks for sharing, take the time to fully recover, and hope to see you back out on the water soon! Sure, happy to get it out there, especially if it can help someone else avoid injury. I talked to a guy at work last week who used to be part of the group at L&I who would interview people after they had gotten hurt at work. He said the reoccurring theme to the stories he heard was that people would say: “I knew it was a stupid choice, but…....” He said hearing that over and over really impacted how he made decisions in his personal life. Good call on pulling your QR and not getting hurt. I’ve decided even if my kite goes down into something like blackberries, I’d much rather spend the money to fix or replace a kite, than the time and money it takes to rehab from injury. October may be optimistic, but I’m definitely stoked to heal up and get back out there. Cheers, Happy Labor Day and good winds for the upcoming season! Shoop - I should probably thank you. Your post was the last thing I read before heading out for the weekend. When launching on Sunday my kite pulled out of the launchers hands and started across the 'power zone'. I immediately blew my chicken loop, got things back in order, relaunched, and was riding within 5-minutes. Easy. Without your post fresh in my head I may have hesitated longer, or tried to salvage the launch... it might have worked... or it might have looped and given me a firm introduction to some logs down the beach. This was a first for me. Everything was rigged correctly. No crossed lines or bridals. I think one of the y's in the bridal grabbed part of the bridal as the kite was being flipped over for launch. Immediately as the kite got into launch position it powering up and turned hard enough to twist out of the guys hands (he was a big dude too, and a kiter). Not sure I could have done anything differently... other than maybe hit my safety faster - in stronger winds I probably would have been airborne already. It's a good reminder to use your safety early and often. Anyway. Thx again for posting.